BeON Home, creator of the first Bluetooth Smart-based home protection system that provides preventative security and emergency lighting, announced that its smart modules and LED light bulbs are now available for order and beginning to ship to homes across North America, reported by Prnewswire. The unique thing about BeON's smart LED bulbs is that they'll automatically learn your daily and weekly lighting routines-when your lights are being turned on and off-as you use them. Then when you're away from home for an extended period of time, you can let the system know of your absence using a free accompanying smartphone app, which will automatically turn bulbs on and off in a believable pattern until you get back. Your neighbors won't even realize you're gone. BeON uses Bluetooth Smart, or Bluetooth 4.0 (also sometimes referred to as “Bluetooth Low Energy” or BLE). This technology is incorporated into virtually all new Smartphones & tablets. Also, your smart phone or tablet communicates directly to the bulbs. BeON’s alarm detection algorithm is programmed to detect the pattern and frequency of standard smoke and carbon monoxide alarm signals. In the case of smoke alarms, the BeOn Home System listens for all alarms that emit the Temporal-3 (T3) signal. BeON's LED bulbs provide 800 lumens (60 watt equivalent) of soft, warm lighting that lasts more than 22 years. The bulbs are 75 percent more efficient than incandescent bulbs and available in standard and recessed BR30 styles. Under the look, each module includes Bluetooth Low Energy connectivity, a microphone, processor and, as mentioned, a rechargeable battery. The clever part is the way the modules in each bulb communicate with each other to share information about learned events, such as doorbells, available battery capacity, lighting status and schedules. There’s an accompanying smartphone app for remote control and further configuration. The BeON bulbs had a crowdfunding campaign at Kickstarter last year, you can now able to purchase at their website. The BeON Home Protection System is now available at www.beonhome.com and through select security dealers. The BeON system is $199.00 and comes with three smart modules and three LED light bulbs as well as the free mobile app. 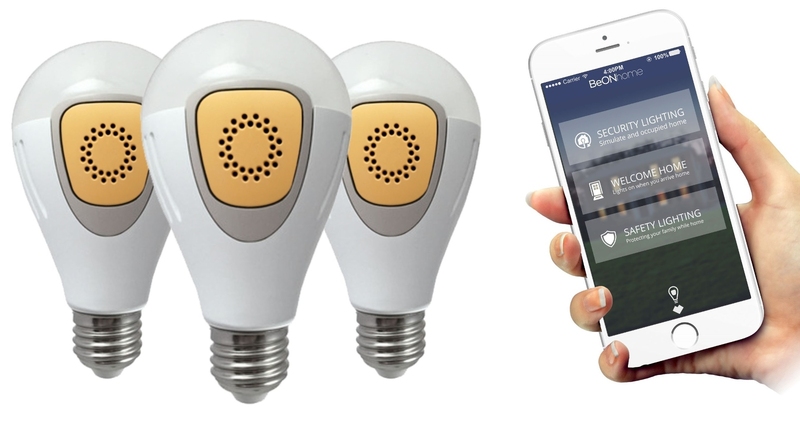 Additional BeON bulbs and modules are available for $75.00 each and can be easily added to the system for larger homes and more protection. The mobile app is currently available for iOS and will soon be made available for Android™, reported by Prnewswire. Explore further about this innovative smart LED bulbs at their site BeON.